100 pairs of socks: ask for them and you get them! Yes, my son in law received 100 pairs of socks for Christmas. It's what he said he wanted. The dryer vortex can have a few snacks now, and he won't notice the loss. Oh, come on guys! When I really need them, the trolls pack up and take their toys home. Mine was too plain and boring to not make the bottom 10! I wanna recount! Ditch the border if you want to go lower. Oddly enough, this is what I've been asking my mother to send me for a few months. Very hard to get decent socks here since virtually nobody wears socks here. Important for me since I've been here close to 4 years without going back. 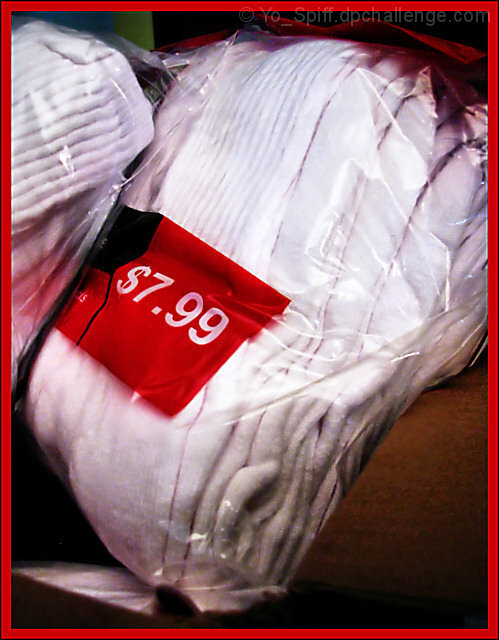 It seems that the wal-mart near her house stopped stocking the regular sized socks and only has kids size and 14-17. Now I know why. You should never ask more than one person for the same thing!!! Hmmm - I asked for 34.5 pairs and didn't get any. No wonder - he probably didn't want to split a package. I'll remember that next year and go for an even number! 2) composition: in the sense that it lacks one. I am sorry to say it this rude, but I realy feel you should have devoted some time to creating a nice composition and show the viewer that these are actually socks. Proudly hosted by Sargasso Networks. Current Server Time: 04/23/2019 08:50:24 PM EDT.